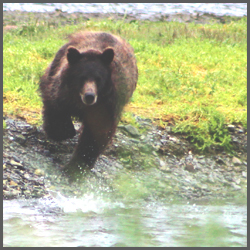 Pack Creek is an amazing opportunity to see bear in natural wild surroundings. It features a viewing area with panoramic views; you can see from the forest where the creek emerges, passing by the viewing area, emptying out on the tidal flats. 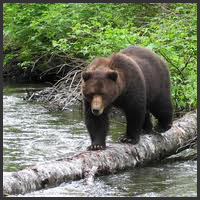 There is also a one-mile trail through the rainforest that leads to an observation tower situated higher up on Pack Creek.When the salmon are running (typically the second week of July), there is a 99% chance of seeing bear. For generations the bears of Pack Creek have witnessed many visitors come and go. Most visitors behave in a consistent and predictable manner causing the bears to become accustomed to human presence. 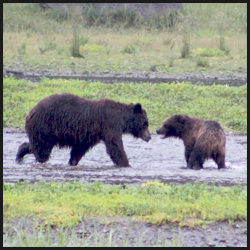 Unlike most bears that do not have regular exposure to humans, Pack Creek bears frequently see predictable behavior from humans each summer, allowing them to continue their normal foraging behaviors without being disturbed by our presence. Following the rules will provide a more enjoyable and safer experience for your group as well as all those after you. This bear sanctuary has been a safe bear-viewing area for over 80 years. Child rates apply to those 15 years and younger.